Indoor plants (or house plants as they are more commonly called) consists of any plant that will grow well in household conditions. These conditions are generally low to medium humidity, reduced or low light, minimally varying temperatures, container growing, with human intervention such as manual watering. The main purpose of growing plants indoors is to provide a sense of nature within the home or space. Green plants also absorb CO2 and release oxygen for a mutually healthier environment. Plants add a calming and natural decor to indoor space as well. Most indoor plants are of tropical or subtropical origin. These are plants that would not survive most outdoor environments unless related to their native growing conditions. They range from very large (such as palms) to very small (such as african violets), most of which grow in their natural environments as understory plants to the taller canopy of the tropical forest regions. These conditions are somewhat similar to most household or indoor environments. Watering and fertilizing should be proportional to light levels. Plants growing in very low light require less frequent watering and nutrient supplement because their growth is inhibited by lower light. Fertilizer stimulates new growth but without proper levels of light, to aid in photosynthesis, can become toxic to an indoor plant. Overwatering is the number one cause of death to indoor plants. As container grown plants in low evaporative conditions, moisture is retained longer and overwatering causes root rot and soil borne diseases. Many tropical/indoor plants are sensitive to specific or levels of certain chemicals in our city water systems and will react by showing necrosis along edges of the foliage. Examples include Chlorophytum (spider plant), Rhaphs palm, Dracaena, Spathephyllum and most plants in the Araceae family. It is always best to use collected rain water or distilled water for indoor plants. An organically rich, well draining soil is preferred by most house plants A loose organic soil allows more aeration for the confined roots and stimulates healthy root growth. Cacti and succulents prefer a mineral based very well drained soil.Being isolated from natural predators, indoor plants can become a target for small pests such as spider mites, aphids, white fly, scale, and other sucking type of insects. Also the lack of drying from natural sunlight and wind can cause fungi and mildews to infest indoor plants, so water indoor plants from the base. Most insect and disease problems can be solved without use of harmful chemicals. It is very important to remove all dying and dead leaves and portions of a plant to prevent spread of disease. Know the plants you are growing around children and pets. Dieffenbachia, pothos, philodendron, and Euphorbias are examples of frequently used indoor plants that are harmful if chewed on. During summer, most house plants enjoy being outdoors in shade and higher humidity and will respond with healthier and fuller growth. However, NEVER take a plant that has been grown in low light and place it in a much brighter light and vice versa, All plants require a period of gradual acclimation to light changes, perhaps up to a month or more of “light adjustment therapy”. 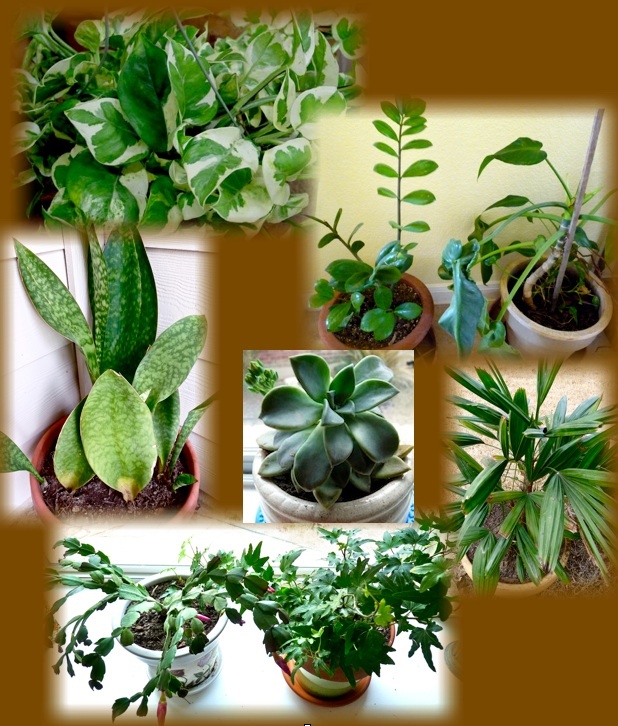 Examples of plants that do well indoors are Agloenema (Chinese Evergreen), Draceana, Dieffenbachia, Philodendron and their Araceae plant family relatives, Sansevieria and other shade tolerant succulents,, Rhapis palm, Chamaedora (parlor) palms, Scindapsis (pothos), Gesneriads and the ZZ plant (Zamicaulus zamiafolia). The horticultural trade had developed, with the exception of palms and ZZ, so many attractive and different cultivars of these plants to add variety in appearance and color. These sports or mutations are propagated/cloned asexually. Many tropical plants are never meant nor will adapt to being indoors. Examples are the colorful Crotons, Poinsettias at Christmas, Ficus, and most flowering tropicals. They require and demand higher light and/or humidity levels. The finicky Ficus will drop it’s leaves when moved to even slightly changed light levels. So, be aware that plants sold as indoor plants may not be meant to be grown indoors and choose only those proven to adapt to indoor conditions well. The inspiration for this article came to me as I saw a mockingbird just outside my window in the weeping Yaupon holly feasting on the abundant red berries. It made me forget about the bitter and damaging cold conditions of the winter of 2011 and all the work it will take to restore my ornamental gardens this spring. It also made me think how beautiful that shiny green holly plant looked with ornamental red berries during the gloom of winter. So, I began to think about other plants that brighten up the dull winter landscape as evergreens while most other plants are dormant and unattractive. My top ten list follows. Criteria is that these plants retain their foliage and ornamental aspects throughout the winter down to 15 degrees in Zone 8b without noticeable damage. 1. Ilex vomitoria (Yaupon Holly): This small leafed holly, native to TX and the south can be as small as 2’x2’ (dwarf form), as straight as a telephone pole (upright form), or as intriguing in the weeping form, or grown into a small tree form. The important thing to know is that yaupons, like most hollies bloom on the female plant as long as male plants are nearby for pollination. As with most hollies, they prefer a neutral to acidic soil, otherwise might turn chlorotic. This is a tough plant, drought tolerant and very cold hardy. 2. Saphora secundifolia (Texas Mountain Laurel): This large shrub or small tree likes it dry and is tolerant of alkaline soils. The grape fragrance of their spring bloom along with glossy green foliage year round makes this native plant a standard for central TX gardens. It will eventually and slowly grow into a small tree form. 3. Eleagnus pungens (variegated cvs only): The foliage on this evergreen plant has a silverly underside and a very flexible branching that can actually be tied into a knot without breaking. Insignificant blooms in spring are fragrant. Due to it’s rapid rate of growth, I recommend only growing the variegated cultivars which are much slower growing and require considerably less maintenance. They add much color to your landscape. 4. Acca sellowiana (Pineapple Guava): The dull green foliage with pubescent silvery underside makes this plant a year-round attraction in the garden. Unusual shaving brush like red and white blooms in spring are followed by edible fruit in fall. The bark is exfoliant, reddish and ornamental as well. 5. Podocarpus microphylla (Japanese Yew): This plant, native to Japan, is a conifer with elongated leaves, not needlelike which provide an attractive texture. It comes in columnar, conical, or dwarf growth forms . I believe this plant is underutilized and more deserving in home landscapes. It prefers neutral to slightly acidic soils. Closely relatated plants include Cephelotaxus harringtonia which comes in upright and prostrate growth forms. Cephalotaxus looks more like the English Yew grown further north. 6, Raphidophyllum histrix (Needle Palm): The hardiest of all palm trees. it will survive to below zero temperatures. This short palmate leafed palm has a bundle of black upright needles eminating from the base, representative of it’s name. It has a nice rosette and formal looking shape and grows to 3-4’ tall. There are many other cold hardy palms to consider as well (Brahia, Serenoa, Nannorhops, and Trachycarpos). 7. Tjuga occidentalis (Arborvitae): A flat leaved conifer that does offer a winter tinting to its bright green foliage, very compact and full. Similar conifers such as Chamaecyparis do not grow well in central TX due to the hot summers, but Arborvitae endure both heat and cold extremes well. Arborvitae comes in conical, dwarf, globular, and threadlike forms as well as golden colored foliage cultivars. 8. Leucophyllum fruiticens “silverado” (dwarf TX sage): The variety recommended stays compact and small for easier maintenance. This silver leafed native plant loves dry, alkaline soils, full sun and withstands our climatic extremes. The lavender blooms of late spring, early summer add to it’s beauty. Green forms are also available. 9. Hesperaloe parviflora (Red Yucca): The straplike leaves eminating from the base of this plant offer a nice flowing texture with threadlike filaments along the edges of each blade. In summer, large, long lasting spikes of tubular flowers add to it’s beauty. A yellow flowering variety has been introduced also. 10. Sotol wheeleri (Wheeler’s Sotol): A nice rosette shape, long thin blades with spined edges give this exotic looking succulent plant it’s appeal. The silvery foliage of this species add another color dimension. The native Sotol texana has solid green foliage. Also consider these plants which meet the same criteria. 1. Sanolina spp. (green and silver varieties): Not getting taller than 12” x18” wide, the ftagrant foliage of this densely compact plant are adorned by small yellow composite flowers in spring. This plant lures you into feeling and smelling it by it’s fine texture and aroma. 2. Penstemon baccharifolius, (Rock Penstemon): This small woody shrub stays 12” tall and wide, with spikes of red tubular flowers in summer. The foliage shows a maroonish winter tinting and is very winter hardy. 3. Yucca spp (palida, gloriosa, recurvifolia, etc. ): Our experience during the most severe winter in Austin is that must yuccas are resistant to winter extremes, unlike most Agaves. Variegated forms are a little less tough than non-variegated. 4. Teucrium fruiticens (Bush Germander): This compact silvery or green form shrub actually likes to bloom in colder months with small lavender, salvia-like blooms. 5. Abelia grandiflora: A nice small leafed evergreen shrub which comes in a variety of sizes, growth forms, and variegations. Blooming in early summer adds to it’s charm. 6. Rosmarinus officinalis (Rosemary): This fragrant compact shrub is so aromatic, and has a beautiful texture of deep green foliage resembling short pine needles. Bloom occurs in spring. It comes in bush and weeping forms. It can be used for cooking year round as well. Do keep in mind that many of the recommended plants come in various cultivars which offer variety for your garden. Also remember that variegated plants are more susceptible to winter damage than all green in most but not all cases. Some evergreens offer a special winter tint or color change (rust or maroon shades) during cold conditions. Blended well with dormant or deciduous plants, they keep your interest going during the off season. When most lawns have turned brown, the addition of garden greenery is a welcome sight. We are not without many beautiful choices for adding color to our winter landscapes. I have included the botanical names for the plants recommended above to make it easier to research them further on Google.Although not evergreen, but a winter winner, is the Possomhaw Holly (Ilex decidua) for winter ornamental value plus provision of food for birds . Like the Yaupon, they will attract feeders and retain their beautiful berries along naked branches in lieu of greenery all winter. So don’t wait until fall to finally decide to add greenery to your landscape for winter. A well balanced garden will include plants of interest for all seasons. Then you can dream about a white Christmas along with a green winter. In February 2011, Austin and central Texas experienced rare winter conditions that even put native plants to the stress test. With a week that saw low temperature of mid teens to near 20 degrees for a prolonged period of over 72 hours where temperatures never got above freezing, this was just too much for some plants to bear. On top of that, the deep freeze followed a healthy rainfall just ahead of plunging temperatures which dropped 60 degrees within 48 hours. During this period, an inch of powdery fine snow fell. Winter temperatures have been periodically running 20 degrees below normals. With the exception of an approximately 20 mile radius of central Austin in hardiness zone 9a, central Texas lies primarily in Zone 8b. This means that the lowest winter temperature that can be expected based on records is between 15 and 20 degrees, so weather of this kind should not come as a surprise, Even native plants like the Anacacho Orchid (Bauhinia lunariodes) can be damaged below 25 and killed at temps below 20 unless in a protected location. These conditions are even more critical for non-natives in our gardens, where we as gardeners love to push the envelope, take chances, and believe we can adequately protect our plants should hard freezes occur. OK, let’s look at a few considerations. Covering non-native or adaptive plants to protect them in a deep freeze condition still isn’t enough to prevent damage. To minimize damage, covers must be thick, non-plastic, and tied down to the ground to isolate the cold completely. It is better to have a damaged plant rather than a dead plant and such coverings may prevent the latter. Plants like cacti, succulents, agaves, depending on species, can survive mid teens in dry conditions only. The addition of moisture to soil or air, and wet coverings is a sure way to kill or severely damage these types of plants. This is why a rainfall before a deep freeze, which we encounter frequently, can be particularly damaging and why soils for these plants must be very well drained. The core of this plant was undamaged allowing for recovery. Freeze damaged portions were cut off. Micro-conditions may exist that determine the fate of a plant in a deep freeze such as protected locations, heavy mulching to prevent root freeze, snow and ice covering which will actually provide insulation to stems and foliage, exposure to wind, etc. Knowing and learning about the plants in your garden through research, trials, and documenting outcomes of plant reaction to certain conditions will help the gardener succeed in getting though the harshness of future winter conditions with minimal impact. Have an emergency hard freeze plant protection plan in place which will allow you to respond quickly and effectively should weather conditions change for the worse rapidly or unexpectedly. This involves an assessment of each plant and it’s ability to survive and/or what level of protection it will require to survive the predicted condition. Well, once the damage is done and assessed, there are recovery strategies for your ornamental garden. Having to buy new plants every year is expensive and not the best solution for most gardeners. Here are a few tips and suggestions. Plant damage sometimes shows immediately effects but often it is never known until a month or more later – a delayed decline and death, In the case of some perennials that have turned to mush, there is the dilemma of whether to cut off the dead portion of the plant which could act as an insulator during future freezes or conversely could possibly create a haven for disease organisms which could hurt the plant further. I suggest that as long as we are subject to hard freezes (and that is guesswork), that the insulation barrier be left there as disease organisms won’t be a problem at those temperatures, but removed when temperature rise permanently above 40 degrees. Don’t be in a rush to trim back damaged plants. If they are unacceptably unsightly, trim back to a point where at least 1” of dead branch is left intact, otherwise, living tissue will be exposed and further damaged, or budding will be stimulated only to be killed at the next freeze. Look for cracking bark, or other telltale signs of die back, or use the fingernail test, nicking the bark to expose cambium at intervals, looking for live tissue, to determine how far back damage has occurred. Often a plant which looks dead, isn’t and that won’t be known until spring initiates new growth. In certain plants, if the core hasn’t been frozen, the plant will recover, such as with palms, cycads, agaves, whose growth is one dimensional or from a single source. 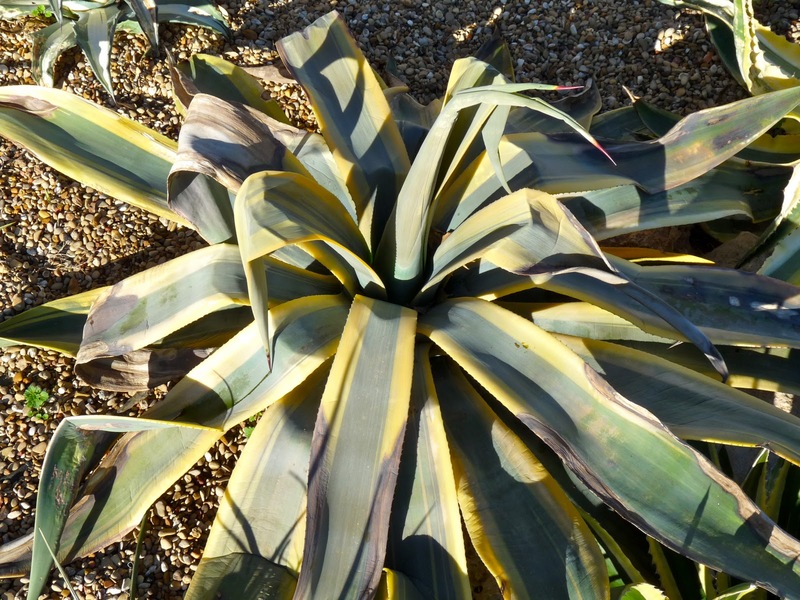 Many plants will regenerate from root buds, such as Yuccas, and many perennials. If after a month of warm spring weather, a plant doesn’t emerge, you can dig and examine the health of the roots – whether they are alive or gone. In that case, trim off the dead roots or portion of the base and replant. Many plants are late to rise in spring such as Hamelia patens, so be patient. If you are fortunate enough to have a greenhouse, cuttings of plants that can be potentially lost during a harsh winter period can be propagated in advance of winter, kept in the greenhouse and planted as replacement plants in spring. This is a particularly good strategy for hard to find plants which would be difficult to replace. 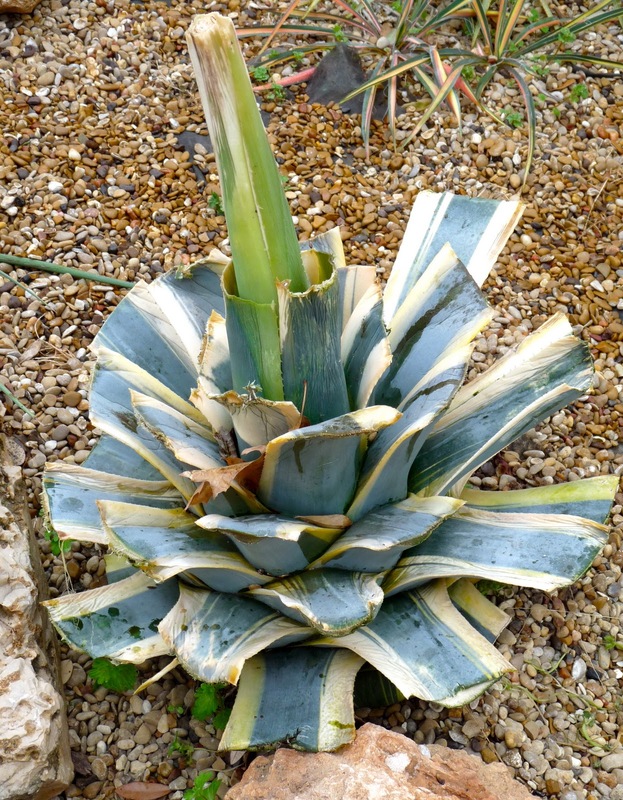 In the case of Agaves that may have turned to mush, examine closely the base and core of the plant and if still firm and alive, the plant will regenerate it’s form quickly in spring. So called “hardy” citrus may lose all their leaves but will regenerate them in spring. 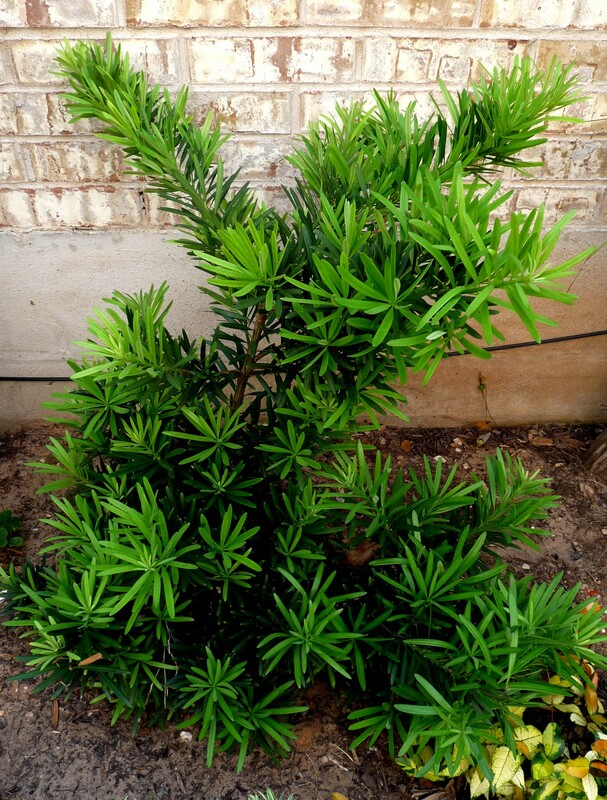 Oleander, Pomegranite, and other semi-evergreen plants will likewise respond after spring pruning. Remember to bring all container plants into a garage or similar protected place. Container plants’ roots are exposed to rapid freezing more so than those in the ground where soil absorbs and retains some heat. Only true Zone 8 hardy plants should be planted in containers which can’t be moved. The worst hit garden in my yard this winter has been the cacti, agaves, and related plants. Accordingly, I have changed my gardening goals for the coming year. I am challenging myself to develop a cacti and succulent garden that will truly withstand mid-teens and Austin winter conditions without protection. That doesn’t mean I get rid of all those plants that were damaged this winter. They will be nurtured back to health and grown in containers so, in the future, they can be removed from the damaging elements as necessary. Slowly but surely, year by year, my garden is transitioning to a sustainable ornamental garden that will survive central Texas extremes naturally. This is central Texas where environmental and climate extremes are commonplace. The argument for growing native and adaptive plants is based on this fact as these are proven survivors in this challenging environment. Consider transforming your garden more in this direction to avoid the agonies of plant damage and loss each winter. But most of all, don’t despair if your garden suffered considerable damage this winter. Everyone else is in the same boat as the winter of 2011 has been an out of the ordinary season. Life in the garden will return in miraculous ways – it always does. A great article on the subject of Freezes and Frosts written by Skip Richter, Travis County AgriLife Program Director also is very helpful in understanding the intricacies of winter damage to plants. Check it out.